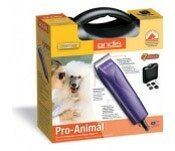 Perfect for complete home dog grooming. Ideal for clipping horses heads, ears, muzzles, bridlepaths and fetlocks. This is really a great deal on a quiet, powerful rotary motor clipper that takes the 13 different AG snap on blades available. Also takes snap on blades from Oster, Laube, Wahl. Kit includes four snap on comb attachments (1/8, 1/4, 3/8 1/2), blade lubricating oil, instructions, #10 blade (64071) all in a durable case.. Break resistant housing, contoured to fit you hand. One year limited warranty.